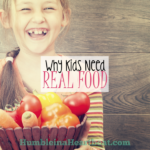 As a mom to a toddler and a pre-toddler, I know just how difficult food education is from the start. If you aren’t sure what you’re doing, those kids will give you a run for your money, and you’ll have no idea what hit you. Pretty soon they will be ordering you around the kitchen, eating snacks in the car, and eating mostly dessert for dinner just because they ate one green bean and you had to follow through with your bribe. 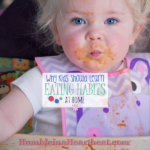 With a little consistency and patience, you can clear up almost any bad eating habit your child has developed. Recently, Sofía has been refusing to eat some foods because they are “yucky.” She takes one look at whatever it is and says, “I don’t like it.” I don’t like the phrase, “I don’t like it,” so much. Somehow it has creeped into her vocabulary. Most of the time, the food she is referring to is one she hasn’t even tried yet. What’s a well-meaning mom to do about a picky child that doesn’t want to even touch the food set in front of her? Rule #6 – For picky eaters: You don’t have to LIKE it, but you do have to TASTE it. 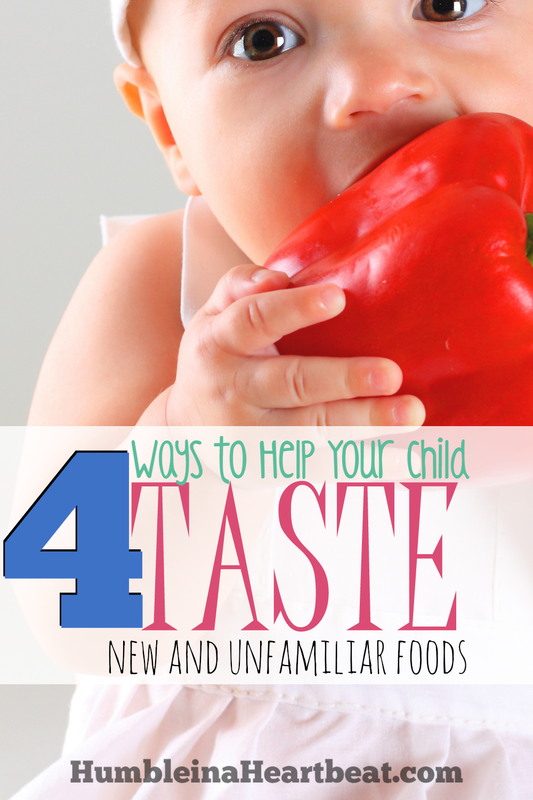 You can’t expect your child to like new foods the moment you offer them. It will take time, but the more you offer the food and your child actually tastes it, he will start to like it…eventually. Don’t give up after the fifth time if your child still will not eat the food after he tastes it. It might take as many as 8 or more times before he finally starts to eat it and like it. Again, consistency is key. My food aversions as a kid included many, many vegetables. But my parents never did anything about them. It wasn’t until I was an adult and got married that I became more open to eating new foods. The first few times I made a dish with onions for my husband and me, I didn’t like it so much. It took a number of times eating dishes with onions before I finally started to tolerate them. Now, years later, I will happily eat onions in almost anything. This only happened because I tried the onions every single time and didn’t pick them out. 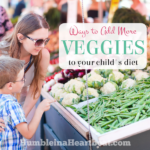 I believe that if you want your child to eat well, you have to be proactive. You can’t just wish that your child was a great eater. You have to teach him how to be a great eater. I think these 4 ideas can replace the phrase “I don’t like it” with “Delicious!” Hopefully, if you are serious about it, you can help your child to be more open to trying new foods. It’s my bet that the reason your child says “I don’t like it” is because the food has been talked down by someone in the family. A food is only as good as its compliments, so any kind of negativity can make a huge impression on your child. Get in the habit of talking the food up. Start talking about the food long before it is ever set in front of your child at the dinner table. Let your child hold the food, smell it, describe it, and even help prepare it. Talk about its positive qualities, and you might see a huge turn around in your child’s attitude toward it. In French Kids Eat Everything, Karen Le Billon says that the French talk about what they are going to eat for dinner at lunch time. It builds momentum and anticipation for the child by giving him an idea of what he can expect in a few hours. This goes along with talking about the food and its qualities above. With our very simple tot school schedule, we have one day each week where we learn about a new food. It’s a wonderful opportunity to introduce food to my children before they taste it. If they have a little knowledge about the food before they eat it, they will likely have more appreciation for it. 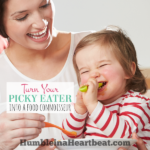 A picky eater goes after foods that she is familiar with and likes. 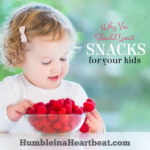 If you are worried that your child will go to bed hungry if she only tries the new food and decides she doesn’t like it, have other foods at the table that you know she will eat. But offer the unfamiliar food first. She has to at least have one bite before she can eat anything else. Get in the habit of offering the new food first, and she will be eating it in no time. What is one food your child will not eat that you would like her to at least try every time you offer it? 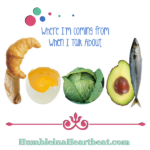 Sign-up for my weekly newsletter below if you want to keep up with Humble in a Heartbeat. It’s all about getting the child comfortable with something they have never tried before. Thanks for sharing your real life example, Saira!